Welcome to Day #1 of Chocolate and Backyard Barbeque Theme Week. As we approach the 4th of July holiday in the U.S., I recall many delightful summers growing up in California. I remember working, playing, biking and swimming until it was time to refuel. And there was lots of food on or near smokey metal barbeques: grilled steaks, charcoal-flecked hamburgers with cheese and bacon strips, hot dogs, potato chips, corn on the cob, green salad, homemade peach and black raspberry ice creams, lemonade, fruit pies, and sliced watermelon, and more. We ate outdoors on red-checkered tablecloths; roasted marshmallows and ate s'mores over beach bonfires; and filled little bags of summer snacks to take on trail hikes. Whew, that was a long list of food items. My backyard grill of choice today is more likely to be a solar cooker, or set of set kebob skewers and a broiler, often because I'm out of charcoal briquettes. Times have changed, but my love of good food outdoors has remained. This week I plan to incorporate chocolate into as many of the examples cited above as possible. 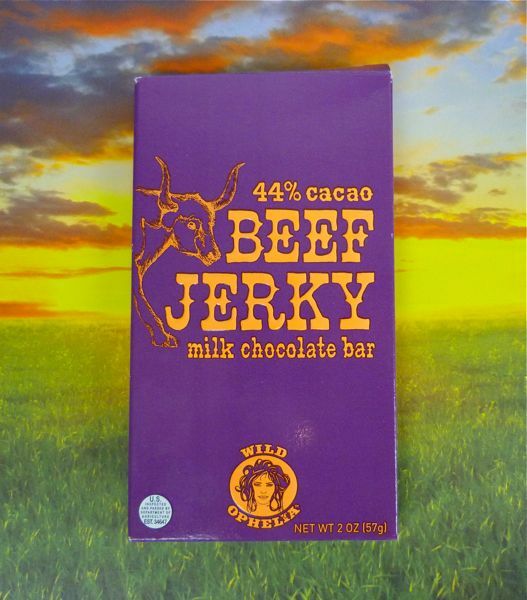 I thought this Wild Ophelia* Beef Jerky Milk Chocolate Bar fit right into this summer outdoors in the West theme and Independence Day timeframe. As the packaging states, "This is not your momma's chocolate bar." 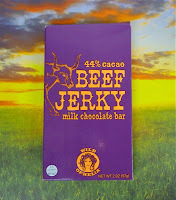 This bar was flavored with bits of beef jerky and smoked paprika, adding a slight smokey and salty flavor to a smooth, 44% cacao, milk chocolate base. *The Wild Ophelia collection of bars was created by Katrina Markoff of Vosges Haut Chocolat (Chicago, IL).